Jordan Babineaux rotated 50/50 with Al Afalava last week which put a serious dent in his tackle production. Afalava suffered a high ankle sprain during the game however and will miss the next 2-3 weeks. This should result in a full complement of snaps for Babs in the immediate future. Similar to Babineaux, George Wilson rotated with Da'Norris Searcy for roughly 20 snaps in last week's game. I would have to believe this rotation will continue moving forward. If this is the case, drop Wilson from a DB1- to a DB3-. Jonathan Vilma rotated with Jonathan Casillas at strong side linebacker. Now that Casillas is healthy, expect this rotation to continue. Neither player has much fantasy value moving forward. Clay Matthews suffered a hamstring injury and will likely miss the next couple of weeks. Erik Walden will become a full time player in his absence. Cardinals OLB O'Brien Schofield will miss the remainder of the season with a torn ligament in his ankle. K.J. Wright left Sunday's game in the 1st quarter with a concussion. His status for Week 10 is currently uncertain. Colts OLB Robert Mathis (back) was unable to return to Sunday's victory over the Dolphins.He did not practice yesterday and is questionable to play in Week 10. Chiefs waived CB Stanford Routt. Javier Arenas will now start opposite Brandon Flowers and is worth keeping an eye on in CB-required and return yardage leagues. RDE Da'Quan Bowers (TB) - I mentioned Bowers as a player to watch in last week's article. He posted a sack in Week 9 and saw his snap counts double from the previous week. He's worth a stash for those in deeper leagues as he will likely be valuable down the playoff stretch. DT Linval Joseph (NYG) - Joseph is quietly having a top 25 fantasy season at the DL position. With offenses focusing so much attention on the Giants DEs, Joseph is receiving a lot of on-on-one matchups and winning them. There's a chance he could start to wear down as the season progresses, but I'd still be comfortable rostering him as a DT1-/DL3- for the rest of the season. RDE Antonio Smith (HOU) - Smith has been virtually non-existent in the tackle department this season with only 5 non-sack attributed solo tackles. However, he does have 4 sacks so far and has a tasty matchup against the downtrodden Bears offensive line. The Bears are going to focus most, if not all, their attention on stopping J.J. Watt which should free Smith up for a sack, if not two. LDE Kamerion Wimbley (TEN) - So far Wimbley has failed to live up to top 15-20 DL preseason expectations. He's only managed to string together 20 total tackles and 3.5 sacks over the course of his first nine games. But when you take a closer look at the pressure stats, Wimbley could very well be on the verge of a breakout. He leads the league in QB hurries with 38 and has registered 0.5 sack or more in three straight games. He draws a mediocre matchup in the Dolphins this week and then goes on bye the following week, but he's definitely a player worth stashing on your bench as a DL4 for the stretch run. WILB Ernie Sims (DAL) - Sims started last week in place of the injured Dan Connor. He was in for 45 of the team's 67 snaps and managed to produce 7 total tackles (5 solo) while quickly emerging as a reliable, all-around linebacker for Rob Ryan's defense. It's telling that after just two weeks, Ryan trusts Sims with the majority of the team's defensive snaps (including some nickel snaps). Sims does have a tendency to over-pursue and get out of position, but he's still only 27 years old and was a former first round draft pick (9th overall). It will be interesting to see how the Cowboys manage snap counts for Sims once Connor returns to full health. Sims is worth a speculative add as LB4 in deeper leagues for now, however. WLB Zach Brown (TEN) - Zach Brown (not that Zach Brown) was on the field for essentially all of the Titans defensive plays in Week 9. This is big news for Brown owners. Labeled as "allergic to contact" early in the preseason, Brown has shown improvement in his willingness to tackle and is starting to grasp the finer points of the game. He posted 10 tackles last week and, if his every down role continues, he should be a solid LB3 moving forward this season. For those in dynasty leagues, now is the time to pounce on Brown, if you haven't already. WLB Bryan Scott (BUF) - Scott is perhaps the best example of a "matchup dependent" linebacker. He's waiver wire material 80% of the season, however, against spread offenses such as New England, he's a worthy, high upside LB3/4 selection. Since he only sees snaps during nickel sets, Scott typically is only on the field for 25%-30% of his team's plays. However, the Bills will likely use their nickel package a majority of the time this week against the pass happy Pats. For reference, the last time the Bills played the Pats back in Week 4, Scott played in 88% of the snaps and 14 total tackles and a FR. Deep sleeper of the week! 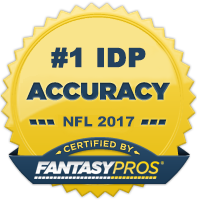 SLB James Michael-Johnson (CLE) - This suggestion is more for IDP dynasty owners. JMJ failed to impress at the scouting combine, but the light seems to have gone on for the 23 year old, 4th round selection out of Nevada. After missing the 1st handful of games due to injury, Johnson has returned to the starting lineup and posted 16 total tackles and a forced fumble over his last two games. He's not an every down linebacker yet and may not be until 2013, but he's shown he can be quite productive on a per snap basis and is definitely worth rostering in keeper leagues. MLB Brian Urlacher (CHI) - Like many, I was down on Urlacher early in the season as he struggled with a nagging knee injury and advancing age. He's shown signs of life over the last couple weeks though with 7 total tackles in each of the last three games and a FF, FR, INT, and defensive TD over that span to boot. He's not going to be the stud he's been in years past, but he's still an every down linebacker who has a knack for making big plays. He'd be a good IDP to have down the stretch for teams looking for a high impact LB3. RCB Nolan Carroll (MIA) - Since taking over for the injured Richard Marshall in Week 4, Carroll has posted 6 or more solo tackles in 4 of his last 5 games to go along with 5 PDs. He also had a sack and forced fumble in Week 8. The Dolphins face off against the Titans this week who have been an above average matchup for CBs. With this said, Carroll is a great start in CB-required leagues and even as a DB3+ in non CB-required leagues. RCB Josh Robinson (MIN) - Johnson hasn't done a whole lot this season from a fantasy perspective with just 33 total tackles in 9 games. However, he has a fantastic matchup against the Lions this week. There have been a total of 12 CBs that have had 6 or more total tackles against Minnesota over the season's first 8 games. The last time the two teams met, Robison had 7 solos. Solid CB2+ play this week. With this said, Antoine Winfield is a must start this week. RCB Leonard Johnson (TB) - With Aqib Talib gone and Eric Wright banged up, Johnson has seen his playing time increased dramatically over the last two weeks. Like most rookies, LJ has been getting thrown at by opposing defenses quite a bit. He's been up to the test however registering an INT in each of the last two games. He has a great matchup against San Diego this week, so expect 5-6 solos and a decent chance for a big play. RCB Derek Cox (JAX) - Cox returned from injury last week and played in all of the team's 72 defensive snaps. He has a nice matchup this week against the Colts and should be able to rack up 5+ solos with a decent chance for an interception. CB1-/CB2+ for Week 10.